Classic Pecan Pie, delicious old-fashioned sweet treat made with just a few simple ingredients. Easy recipe, perfect for your holiday dessert table! First things first, mix up a pie crust... You can make a more traditional roll-out pie crust or an easier shortcut no-roll crust. 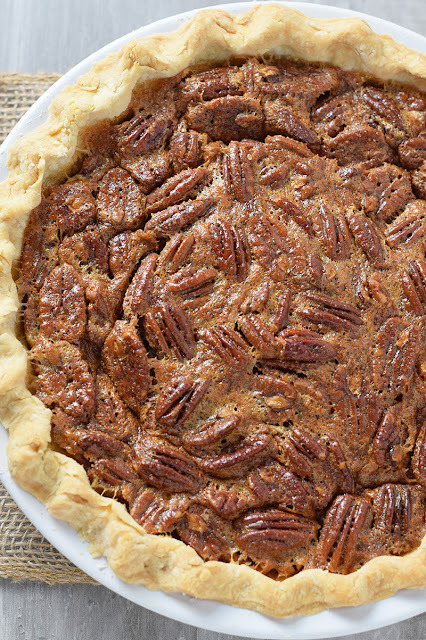 Chill the pie crust 'til you're ready to pour in the filling. Using a mixer, cream together the butter and sugar. And by cream, I mean mix together really well until it becomes a creamy mixture. Lightly beat the eggs together. Then mix them into the butter/sugar mixture. Add dark corn syrup and vanilla to the mixture, mixing well. Pour the pie filling into your unbaked pie crust. Bake the pie at 450° for about 10 minutes. Then reduce the heat to 350° and bake an additional 30 minutes. You may want to use a pie shield or a strip of aluminum foil to keep the edges of your pie crust from getting too dark or burning. When your pie is fully cooked through, remove it from the oven and cool on a wire rack. Serve each slice with a creamy delicious dollop of whipped cream!